Today, the American Action Forum launched AAF Solutions, a new initiative that will offer positive, constructive, digestible, and actionable policy solutions to solve ongoing problems the country faces. With so much of the national debate always focused on the negative, AAF Solutions products will approach policy a different way, defining the problem and then proposing reasonable and actionable solutions that address the problem. AAF Solutions’ inaugural proposal is a way to better protect taxpayers under the Terrorism Risk Insurance Act (TRIA). The AAF Solution is to shift additional risk and costs to insurers in incremental and predictable increases for the next 5 to 7 years via the deductible and other risk sharing mechanisms of the program. The total increases in these mechanisms would be tied to the number of years the program is reauthorized. 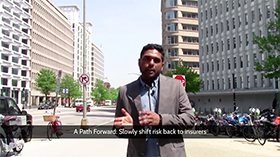 Click here to watch Satya Thallam, AAF’s Director of Financial Services Policy, explain the TRIA solution.